By the time she realizes she loves him, he’s already gone. Shelby and Tanner have been inseparable ever since freshman year when she intervened to save him from a bully’s beating. Fast forward four intense years--Shelby is leaving for college. Without Tanner. Three days before she’s set to move, he hands her a thick envelope with explicit instructions: In no way shape or form is she to open the envelope until she is perfectly settled in at school. She is not to even think of it until then. No one has seen Tanner since that moment. She opens the envelope to find a letter of epic proportions inside that spans their years in high school together. When she reads it out loud to almost her entire dorm, Shelby relives the good and all of the bad, and together they learn details that Tanner held back, the things he never told her. How much he really loves her. Sometimes, all it takes is walking in someone else’s shoes to realize what you’ve known all along. Sometimes, that realization comes too late. This is the first time I have read a work by this author. I was not sure what I was expecting but I knew it might be an emotional ride. An entering college freshman, Shelby, receives an envelope from her best friend Tanner on the day she is set to move to her college and begin the next steps in her life. However, what Shelby is prepared for is that this enveloped contains letters covering the last four years of Tanner's life. A life full of love, sadness, confusion, and but most importantly friendship. I found it quite interesting to read a novel that tells the story over the course of four years. I have only read one other book that is written similarly and both I have enjoyed. In the course of four years we see all the triumphs and all the downfalls. We see all the first moments and last moments. We see all the beginnings and all the ends. Author Katie, in these four years, show us the struggles that teens face in high school on a daily basis. She shows us the bullying. She shows us the pressure we are under. Katie shows us through Shelby that when we are young we don't have a sense on what outcomes happen on the decisions we make. That the choices we make won't have serious consequences because we are still young and naive. It is not till we are older and we reflect back on what has taken place do we realize that some of our biggest mistakes happen because we didn't do or say anything. 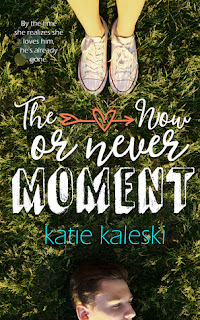 The Now or Never was a book that made me want to take some time out of my every day life and reflect on the choices I have made. It has made me realize that the choices we make can have an effect on the people we surround ourselves with on a daily basis. For those of you that are wanting to read a book that takes you on an emotional four year journey than Katie's book is for you. Good review! Having read a couple of Katie's other books I'm not surprised that you connected with this one so much. She's super talented. On another note, you may have the coolest reviewer alias ever!